This morning, I'm in that quiet space of holding the stories from the past few months that I haven't shared here and the desire to let them all tumble out. It's this space of being "almost there" and feeling like I'm on the cusp of bursting with all that I want make happen. 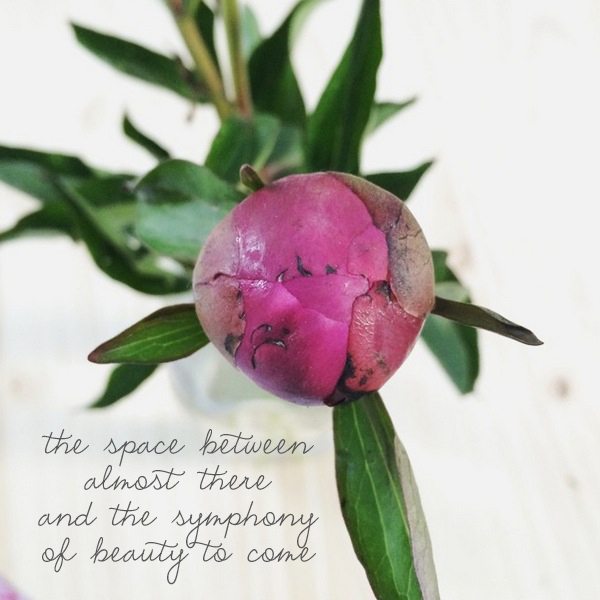 So I'm starting this post with that peony above because 1) I can't stop with all the peonies all the time right now and 2) It is like a visual of how I feel inside. As I shared with my newsletter subscribers earlier this week, last weekend I visited my mom, and we did a pretty amazing deep dive into my business. I've been looking at where I've been, what I've created, and the ways I share it all with you. I've been having hard conversations and really exciting ones. And I can't wait to tell you more about it through some new blog posts and my newsletter. One thread that runs through my business that has come forward through these conversations (and the work I've been doing during the last few months): I want to help you build a bridge between what daily life looks like and the life you most want to for yourself (and those around you...and the world). If you follow me over on Instagram, you're seeing some peeks at how I'm doing this over here. And I'm doing it one move at a time. Sometimes one move looks like sitting in the backyard with Ellie as we slide beads onto wire and eat strawberries and chat about how we can invite in more kindness. And for 10 gorgeous minutes, she just stays present and calm. During moments like this, I capture a photo and imagine that I'm sitting on the bridge between daily life and my own longings and I'm dangling my feet over the edge and choosing to see the beauty, knowing it might be fleeting because life is unpredictable with a four year old. Sometimes this move looks like slogging through a metaphorical overgrown meadow with weeds as high as my waist as I somehow keep walking and cross items off the to-do list and try not to lose it or use that tone of voice that triggers everyone (including me) and I just keep taking one breath, one step, repeat. And then somehow there's a pause in it all and I'm able to remember I have go-to moves to reconnect me with joy. So I choose to turn up some music and twirl and find myself again. But even though twirling might be involved, it isn't always easy. Sometimes this move looks like just standing right here. Hand to my heart. Taking five deep breaths. And sometimes this move is a big one, like choosing to rebrand my website (coming soon!) and asking my husband on a date (for real). My hope is to be a guide for you as you move closer to your own longings, closer to having more really good days in the midst of whatever life hands you, closer to seeing the beauty even when it storms. And one way I want to do this is through my new Back to the Basics one-on-one offering. It's in the Beta Testing phase right now, but I'll be opening it to you next month. If you want a sneak peek and to sign up to get first dibs on the handful of spots I'll be opening, head over here. As you walk through your day in your corner, I hope you'll spend some time thinking about the bridges you're building. What would it feel like to let go of "all or nothing" when it comes to making shifts in your life? What if the moments when we realize things aren't working are actually clues to how we can tweak the way we're building the bridge between our day-to-day lives and the dreams inside us? What if you could live your dreams into reality one move at a time? These are the conversations I want to have with you.